The year of 2017 will go down as one of the best in all of gaming. From the release of Nintendo’s Switch console to the abundant amount of triple A titles worth your time released this calendar year, it’s hard to find any other time it’s been this great to be a gamer. As the year wraps up I wanted to look back at some of the games that shaped the past 12 months for me. While there were many games I played this year, only a select few stand out as truly awesome. This is one of them. Nintendo threw out some shockers at this year’s E3 in June, not the least of which being a new Metroid game. I’d say it would have been the biggest news coming out of the big N’s Treehouse event, but that crown could be taken by a multitude of other announcements (again, not the least of which being another Metroid announcement). Despite this, we got a brand new adventure with Samus Aran on the 3DS in the form of Metroid: Samus Returns. As mentioned in my earlier review, Samus Returns is a remake of the second game in the series Metroid II: Return of Samus for the original Game Boy. That game has a special place in my heart thanks to it being one of the earliest gaming memories I have. While Return of Samus is all kinds of nostalgic, Samus Returns is all kinds of awesome. Gone are the limitations the original game came with, and in its place are updates the franchise has come to know as standard here in 2017: running and shooting in multiple directions, different powerups for Samus’ suit, and an expanded story touching on topics which came up in later games. In short, it’s more than a simple remake. Even if you haven’t played the original Game Boy title, there’s still plenty to love in Samus Returns. The game controls smoothly, it looks great, and it’s addictive enough to keep you wanting to come back for just a bit more. Not only that, the music is fantastic! If there are any gripes with the game it’s likely from those who scoff at amiibo support blocking content (which isn’t actually blocked, you can just unlock it earlier), and the overall degree of difficulty. Nintendo has made games for decades, and their expertise shines through. The best games are not only technically well made, allowing you to do what you want to do when you want to do it, but also leave a lasting impression on you. Other games are certainly more epic than this one, but the adventure on SR388 is full of danger, exploration, advancement, and satisfaction. 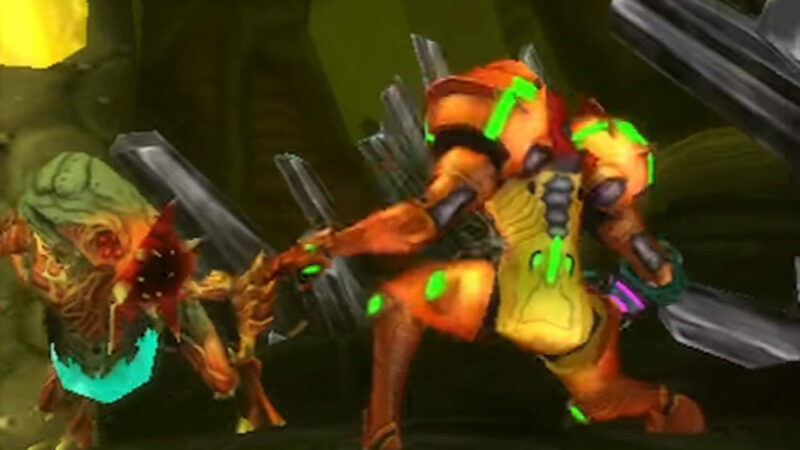 Metroid fans have a lot to be thankful for this year, and the surprise release on the 3DS is just the beginning. While the 3DS has been winding down in terms of quality games as of late, likely due to the launch of the kind-of-a-handheld, kind-of-not Nintendo Switch, it’s nice to know Nintendo still understands their market and player base. The little portable console that started out slow and grew into a phenomenon is on its last legs, but still pumps out quality games even in 2017. Here’s to a 2018 with even more fantastic games! Be on the lookout for more entries into my top games of 2017. Before the year is out I’ll recap the best of the best, and crown one game as DownStab’s Game of the Year. Who knows; maybe one day that achievement will mean something and they’ll slap it on the back of the game’s box. One can only hope.